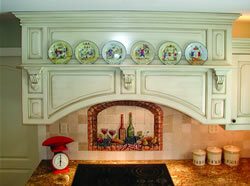 Vermont Woodland Cabinets offers a variety of molding and trim, which is both decorative and protective. Installing interior wood trim and hardwood moldings can add character and style to a room or piece of furniture, and serve as protection from wall damage, drafts and wood expansion/contraction problems. Choosing the correct trim is important, and we have many choices available to you for crown molding, baseboard, chair rail, window/door trim and wainscoting.